Even in a world where the big TV brands are falling over themselves to hit ever-lower price points for their products regardless of whether they’re actually able to make any money out of them, Samsung’s PS51E490 comes as quite a shock. After all, it’s not every day you see a massive 51-inch plasma TV that can be yours for £799.99 / US$799.99 (around AU$1,157). What’s more, its striking screen size to price ratio isn’t its only attraction. It also serves up, for instance, a surprisingly solid array of features, including multimedia playback via USB or networked PC, a built-in Freeview HD tuner, and even active 3D playback – complete with two pairs of free 3D glasses. It’s a bit lacking in the connections department, though, with its measly two HDMI ports, one USB port and no integrated Wi-Fi. It also doesn’t carry any online features, so you can’t access Samsung’s wide-ranging and impressively presented smart TV service. From a picture quality point of view, the Samsung PS51E490’s cheapness means you have to make do without the high-contrast Real Black Pro filtering system employed by Samsung’s more expensive plasma TVs. You also have to accept that its native pixel count is 1024 x 768 rather than a Full HD 1920 x 1080. This latter point could be a deal breaker in itself for some AV fans. But surely if you’re only willing to spend £800/US$800 on a 51-inch TV, you know you’re going to have to accept compromises somewhere, right? 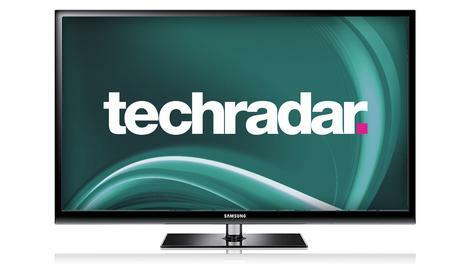 If you do decide the compromises just discussed aren’t for you, then the next series up in Samsung’s plasma range is the E550 series, which introduce both Full HD resolutions and online functions, as well as an extra HDMI and USB port. 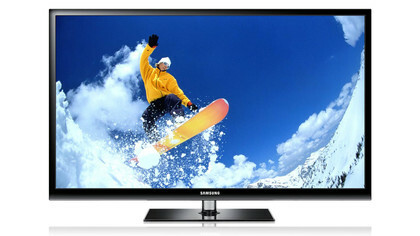 Step up higher still and you can get the Samsung E6500 plasma series, which crucially introduces the Real Black Pro filter with its pretty profound boost to contrast. The Samsung PS51E490 also has a 43-inch smaller brother in the UK, the PS43E490, priced at £599.99 (around US$907 / AU$868), if you fancy a smaller screen. Many of you will want the bigger screen but won’t actually have more than £800/US$800 to spend on a new TV, though. So let’s find out if the Samsung PS51E490 still delivers real bang for your minimal buck. The most bare but intriguing facts about the Samsung PS51E490 are that it gives you 51 inches of plasma-generated pictures for just under £800/US$800. Couple this with the Samsung brand name, and you’ve already got a proposition with significant shelf appeal. The Samsung PS51E490 doesn’t depend solely on these star attractions for its appeal, though. For starters, it’s not a bad looking TV provided you’re able to see past the fact that it doesn’t follow the current trend for ultra-slim bezels. Its dark finish is subtly but pleasantly alleviated by a gentle gradation effect, and its lines, while not especially imaginative, are quite dramatic. Then there’s the Samsung PS51E490’s array of multimedia talents. A USB port, for instance, permits playback of a decent mix of video, photo and music file types, while a LAN port (Wi-Fi is only available via an optional extra USB dongle) enables you to stream the same sort of content from a networked PC. Plus, of course, you can simply connect a PC to the TV via a provided D-Sub PC port. There is one disappointment here, though, since it transpires that the LAN port doesn’t provide access to Samsung’s smart TV online platform. This is a significant blow when you consider just how many extra video and multimedia services – including exclusive Fitness and family network zones – Samsung’s smart TV delivers. To be fair, though, it’s inevitable that a TV as cheap as the Samsung PS51E490 will have to do without in some areas. Significant compensation for the Samsung PS51E490’s missing online features comes from its support of 3D playback. 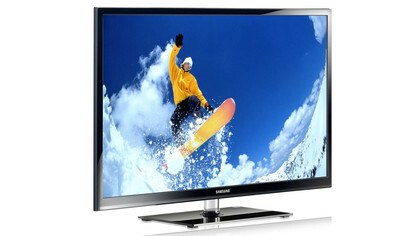 This is of the active Full HD variety, and Samsung has even managed to ship two pairs of 3D glasses with its cut-price plasma television. This is pretty embarrassing for the likes of Panasonic and Sony, who (respectively) only provide free glasses with their flagship TVs or don’t provide any free 3D glasses with their TVs at all. Heading into the Samsung PS51E490’s on-screen menus, meanwhile, uncovers a surprising bounty of picture adjustments. Among the most unexpected calibration tools at your disposal are a Cell Light adjustor that gives you an extra means for getting the right balance between shadow detail, contrast and black level response. Plus there are a few gamma presets to move between, a full white balance adjustment, MPEG and standard digital noise reduction filters, and multiple dynamic contrast settings. Although you can’t adjust it via the on-screen menus, another good feature to find on a plasma TV as cheap as the Samsung PS51E490 is its 600Hz sub-field driving for enhanced image stability and motion. We can’t leave this section, though, without making you aware of a couple more potentially substantial compromises associated with the Samsung PS51E490’s price point. First and worst, it doesn’t enjoy a Full HD resolution. Instead it gets an HD Ready 1024 x 768. For people who like the idea of mapping HD sources such as Blu-ray films to a screen on a perfect pixel for pixel basis, this reduced resolution could be a deal-breaker. The other downer for film fans is the Samsung PS51E490’s use of a Real Black panel design rather than the Real Black Pro design sported by Samsung’s more premium plasma TVs. This essentially means that the Samsung PS51E490 lacks a contrast-boosting light filter sported by higher-end models, and so will likely not deliver the same sort of black level response. How good the Samsung PS51E490’s pictures are depends more than usual on what you feed it. Starting with the good news, it’s much more assured than you’ve really any right to expect for its money when fed with HD sources. The most surprising of its strengths with Blu-rays is the sharpness with which it reproduces HD’s high-resolution images. From a sensible viewing distance it’s extremely hard to spot any tell-tale signs that the panel isn’t sporting a Full HD pixel count. Edges look crisp, textures look rich, and there are no really obvious signs of any downscaling processing going on. If you really look hard and get up close and personal with the screen then you can make out a touch of softness in some very textured areas of HD pictures, and the occasional marginal colour error. But these issues aren’t nearly severe enough to make us suggest even for a minute that the Samsung PS51E490’s non-Full HD native resolution sells HD significantly short. The Samsung PS51E490’s clarity relative to most of the affordable flatscreen TV scene also owes a considerable debt to plasma’s innate ability to reproduce motion without losing resolution. There’s a bit of judder around, especially with 3D, but this is preferable to the blurring and even smearing often witnessed over motion on budget LCD TVs. HD pictures also enjoy a strong colour performance. Tones look pleasingly vibrant and enjoy a surprisingly wide range for such a cheap TV, plus the set is as comfortable at rendering relatively subdued, dark colours as it is bright, punchy ones. There is occasionally a touch of blocking with skin tones and some minor striping over subtle colour blends, but no more than you commonly see at the relatively affordable end of the plasma TV market. There’s nothing so severe that it provides a regular distraction from what you’re watching. The Samsung PS51E490’s ability to reproduce colours well during dark scenes is a function of another respectable part of this cheap plasma’s performance: contrast. Because as well as some reasonably pure bright whites and punchy colours, the TV can produce a deeper black colour than is common at its price level. To put this in its proper perspective, there is undoubtedly a greyer look to dark parts of the picture than you get with Samsung’s Real Black Pro TVs or, especially, Panasonic’s plasmas – at least those from the UT50 level and higher. But this greyness isn’t severe enough to make dark scenes hard to get immersed in. It also doesn’t heavily infuse the subdued colours generally on show in dark scenes, and nor does it tend to obscure much of the shadow detailing that’s so important to making dark scenes look credible. The Samsung PS51E490’s impressive HD performance is joined by a better-than-expected 3D effort. Particularly welcome is how little crosstalk pictures suffer with. Some previous very cheap 3D plasmas have suffered excessively with this double ghosting phenomenon, yet while it’s certainly not completely absent from the Samsung PS51E490’s 3D images, it’s neither common nor aggressive enough in its appearance to spoil your 3D experience. The Samsung PS51E490 also retains a bit more colour vibrancy and brightness than many other 3D plasma TVs we’ve seen, and while, as noted earlier, there is a bit of judder, in general motion is handled at least well enough not to make it a frequent distraction. There’s a nice sense of depth too, and flicker from the active shutter glasses doesn’t feel too obvious or fatiguing unless you’re watching in a bright room. Colours look a touch cartoony in 3D mode and there doesn’t seem to be as much detail and sharpness when watching 3D Blu-rays as you tend to get with the best active 3D TVs. But 3D pictures are never less than very enjoyable to watch. Inevitably, though, given its price, there are a few significant issues with the Samsung PS51E490’s pictures beyond the relatively minor ones already touched on. The worst is that its upscaling processing isn’t very special at all, leaving standard definition pictures looking rather rough and ready; soft, noisy, and not as natural where colour tones are concerned as the set’s HD pictures. There’s also a bit of general green dotting noise on show in very dark parts of the picture – especially in 3D mode, when the panel is having to work especially hard. This isn’t very obvious from a sensible viewing distance, though, and is reduced considerably if you set the Cell Light feature lower than its 12 level. Finally in the negative department, the TV tends to infuse its pictures with a little touch of green bias that no amount of tinkering with the available colour and white balance tweaks can wholly remove. But this is something you find yourself acclimatising to over time. The Samsung PS51E490 overall deserves to have us finish on some highs where its pictures are concerned. So let’s wrap up by saying that its pictures largely avoid the fizzing noise problems over skin tones often seen with plasma. Also, it can be watched from a much wider viewing angle than any LCD screen, and it suffers only 30-35ms of input lag, which is low enough to make it a very respectable option as a gaming monitor. While there’s nothing especially brilliant about the Samsung PS51E490’s operating system, nor is there anything significantly wrong with it. The on-screen menus don’t enjoy the Smart Hub menu that works so well on Samsung’s smart TVs, but the menus still look clean and legible, and are reasonably sensibly organised (with a couple of exceptions that we’ll get to in a moment). The remote control is a bit plasticky and feels old-fashioned with its layout in terms of the weighting it gives to some of its functionality, but it’s reasonably responsive and easy to learn your way around. The two big gripes we have with the Samsung PS51E490’s operating system are the way Samsung bizarrely puts the TV’s important Game preset in a submenu of the System menu rather than with the TV’s other picture presets, and the unnecessary and arbitrary splitting of the most useful picture settings across two menus, rather than putting them all together. The relatively bulky body wrapped around the Samsung PS51E490’s screen might not be especially trendy by today’s super-slim standards, but it does seem to help the TV produce a better sound performance than most budget flatscreen TVs. Voices sound convincing and well-rounded, there’s a surprisingly respectable amount of bass at the lower end of the audio spectrum, and the mid-range is open enough to expand at least a little when required by an action scene. A bit more treble detail would have been nice, but at least the TV’s focus on the mid and lower end of the audio spectrum means that the audio doesn’t often slip into the harshness common with budget flatscreen televisions. You won’t be surprised to hear that it’s here where the Samsung PS51E490 makes its biggest mark. Spending just £799.99 / US$799.99 (around AU$1,157) on a 51-inch TV would seem a pretty sweet deal even if that 51-inch TV wasn’t that great. So it becomes a bargain of almost absurd proportions when you consider that the Samsung PS51E490 delivers some more than respectable 2D and 3D picture quality, two pairs of free 3D glasses and even some useful multimedia talents. The sacrifice of any sort of online support to hit a price might be a compromise too far for some people, but for many others the size and quality of its pictures will be reward enough for so little outlay. It’s fair to say that normally if you see a price of less than £800/US$800 attached to a 51-inch TV, you probably won’t expect that TV to be up to much. Right from the start, though, the Samsung PS51E490 starts trying to oppose those negative expectations with a design that’s stylish, if a bit too chunky to be trendy. There’s a brief ‘living down to expectations’ moment as you find the TV carrying only two HDMI ports, not having a Full HD resolution, and not supporting Samsung’s smart TV online services. But once you’ve taken these shortcomings on the chin, it’s pretty much all uphill from here. HD picture quality in 2D and 3D mode is surprisingly strong, with good colours, more sharpness than expected, solid motion reproduction and a handy contrast performance by budget TV standards. Its PC network and USB multimedia playback features are strong too, and the inclusion of two pairs of free 3D glasses with the TV is an act of startling generosity. Yes, you can get better plasma TVs if you spend more money, but so what? The Samsung PS51E490 is specifically designed for people who can’t afford to spend more money, and it satisfies the likely needs of that target audience well. The price of the Samsung PS51E490 is enough to put a smile on any cash-strapped film fan’s face, making it one of the cheapest 50-51-inch TVs around. 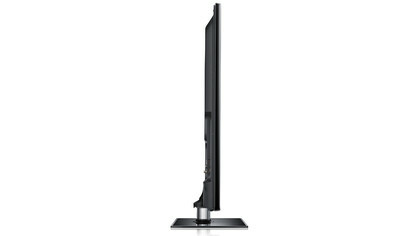 Even better, though, is the fact that the Samsung PS51E490 doesn’t only get by on its price appeal. Its pictures are much better than those of most budget big-screen rivals, in both 2D and 3D mode, and it delivers some decent multimedia playback from USB or networked PC. It even sounds better than average. The lack of any online services is unfortunate if understandable given the Samsung PS51E490’s price. Standard definition pictures are a bit rough looking too, and you can get better contrast if you spend more on another plasma TV (surprise surprise). Finally, the TV doesn’t have a Full HD native resolution, and can suffer a little judder with its motion. Samsung might like crowing about its high-end LED TVs, but the Samsung PS51E490 proves the brand still knows its way around the budget end of the market too. Its picture and sound performance are both much better than you’ve any right to expect from a 51-inch TV that costs less than £800/US$800, and it even gives you a Freeview HD tuner, multimedia playback from USB or networked PC, and active 3D, including two pairs of glasses. It’s not the best with standard definition pictures, and you can’t take it online for streamed video. But we personally felt more than happy to live with these compromises in return for the Samsung PS51E490’s other talents. If you’ve got your heart set on a plasma TV (and there’s no reason why you shouldn’t have) then you could consider Panasonic’s P50X50, which has maybe marginally better pictures for similar money but doesn’t have 3D. 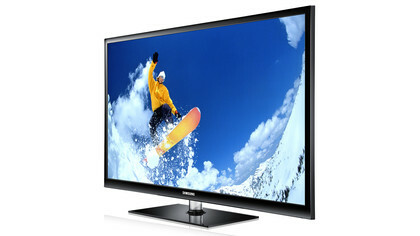 If you want 3D on a different plasma TV, your cheapest good rival is the Panasonic P50UT50. If you’re willing to think about LCD, good options would be the LG 47LM620T, which delivers a passive 3D option complete with seven pairs of glasses included for free, and Samsung’s own UE46ES6300, with its active LCD system and online services. Both these LCD options are a bit smaller with their screen sizes than the Samsung PS51E490, though.